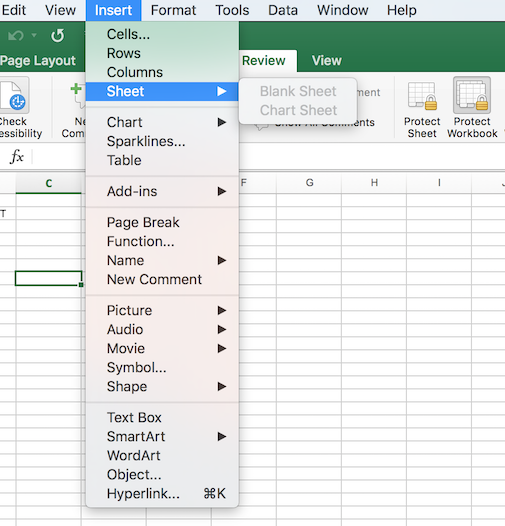 When I tried to insert another worksheet in an Excel workbook today, I found that the option to insert a new blank worksheet was grayed out when I clicked on Insert and selected Sheet. When I tried another means of adding a new sheet by clicking on the plus sign at the right side of the list of sheets in the worksheet to add the sheet, I saw an alert message stating "Workbook is protected and cannot be changed." I deleted the F91C, so that I had workbookPassword="", and saved the file. I then recompressed the contents of the directory into which all the files in the .zip file were extracted using the Zipdir Python script, since using the Finder or the command-line interface (CLI) zip utility that comes with OS X will not produce a zip file that Excel will be able to open if the .zip file is renamed to .xlsm. After I renamed the .zip file to be an .xlsm file, I still saw the option to insert a new sheet greyed out when I chose Insert and Sheet and I still received the same "Workbook is protected and cannot be changed" message when I clicked on the plus sign at the bottom, right side of the Excel window to add another sheet, but I was then able to click on Review, which appears in the menu bar row where Home, Insert, Page Layout, etc. appear, and then click on the Protect Workbook icon to remove the workbook protection. When I opened the Protect Workbook icon had a dark gray background around it whereas Protect Sheet did not. When I clicked on the Protect Workbook icon, the dark gray background disappeared and, instead, the background then looked like that for the Protect Sheet icon. I was then able to add a new sheet to the workbook and use the new spreadsheet.